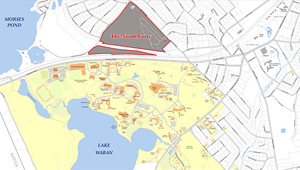 Working since last May, the Town of Wellesley and Wellesley College developed timelines for our respective processes regarding the future of the North 40. It was initially envisioned that decisions in this regard might be considered at a meeting of the College’s Board of Trustees and a Town of Wellesley Special Town Meeting, both of which were previously planned for the end of October. With this goal in mind, the Town and the College have been working diligently and in good faith throughout the spring, summer and early fall. Discussion of the future of the North 40 has triggered a rich portfolio of potential ideas, and the Town’s proposal is one of those under consideration. Given the importance of the North 40 to our shared community, both the College and the Town recognize the need to allow further time to complete these important deliberations. Accordingly, the two parties have agreed to defer final decisions by the Trustees and Town Meeting until a later date. We are working collaboratively to develop a revised timetable and will provide more guidance on this shortly.